I saw this on a web site a few days back and decided this is the place for the DM-200. 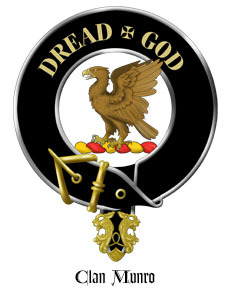 My preference is the large digital read out, but you can do gauge style if you like. The DM-200 will display any data that our computer can give it, such as actual water temp, intake air temp, etc., and the boost module provides the Vacuum and Boost data. First thing is to remove the mirror. Note the small spring tab that has to be released with a small narrow screwdriver. Once released the mirror just slides off toward the top of the windshield. Carefully remove the Mazdaspeed cover. It is held in place by two strips of foam tape. 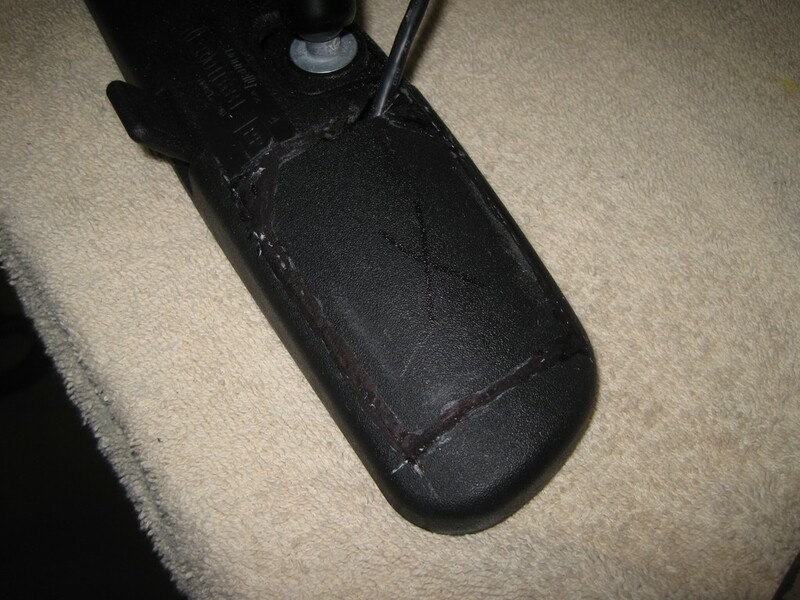 With a little hand prying (no tools) the tape will pull away from the back of the mirror. 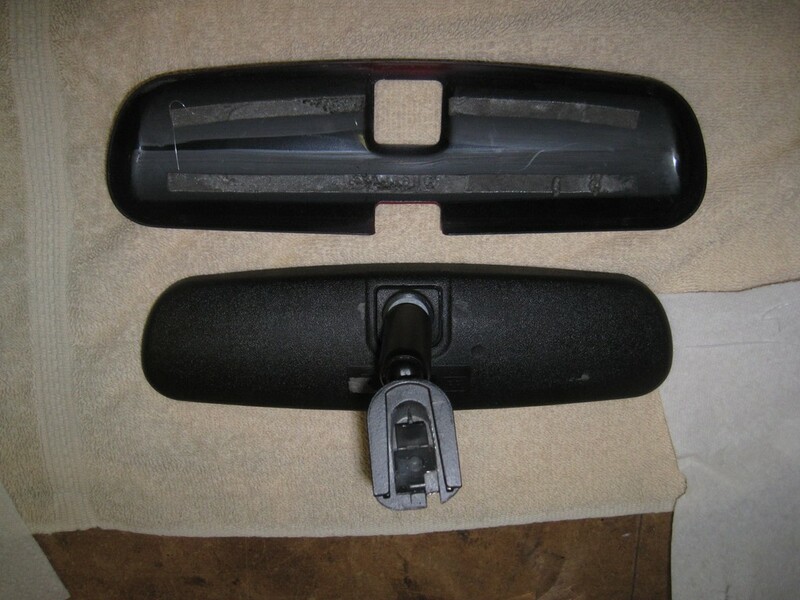 The plastic composition and texture of the mirror back allows for the tape to come loose. Exercise patience and it will gradually let go. I first thought the glass could be removed from the mirror, but after working on it a little I decided it would be destroyed. Now the cutting begins. I used a Dremel tool that slowly moves the blade back and forth so it does not get hot and melt the plastic. My cut was a little too close to the mirror stem and resulted in a conflict with some stiffening ribs that could have been avoided. Otherwise it went pretty smooth. 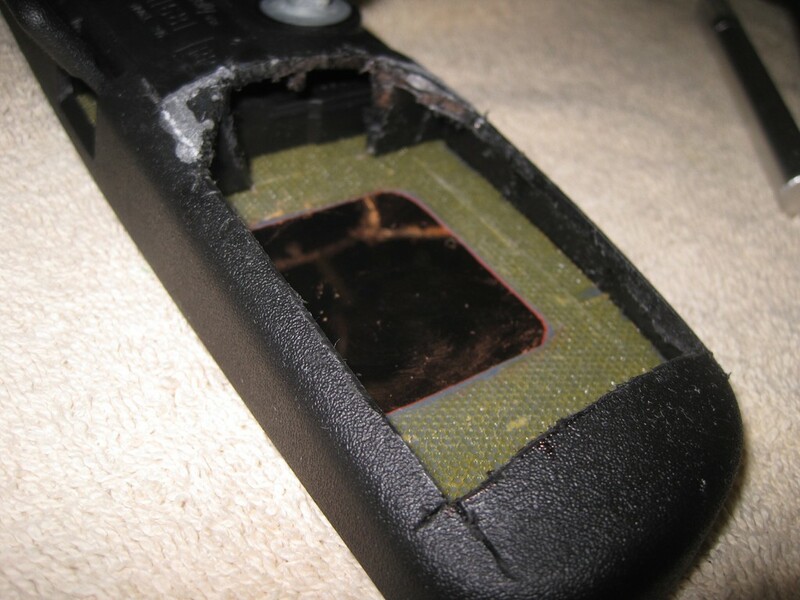 To finish up the corners you can heat up a narrow putty knife to melt the remaining plastic that might be preventing you from getting the piece out. Pretty rough, but the cut is now complete and time to work on removing the gum backing, two layers of paint (one gray and one red), a copper coating and the mirror silvering. Note the two corners that are mitered. That could have been avoided by cutting a little further away from the mirror stem. Not a real problem, but a little unsightly. Fortunately it all gets covered up by our Mazdaspeed. The photo above is after the gum and two layers of paint are removed exposing the copper coating. 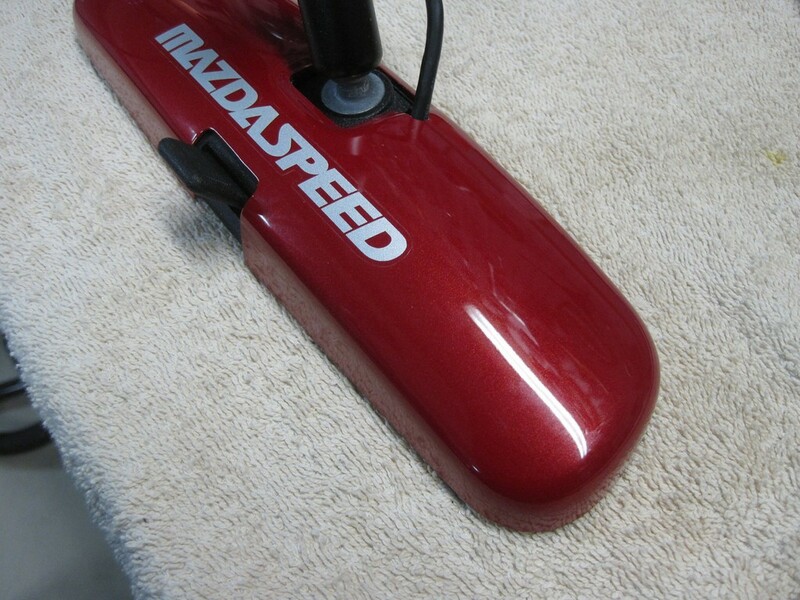 The gum is easily scraped away with a "nylon" scraper or burnishing tool. Don't use anything metal to remove the gum or paint since a metal object will scratch through the mirroring and mess up your project. The paint was removed using "Citristrip" stripping gel found at Lowe's. It takes about 30 minutes for the gel to work and the paint comes off pretty easy using the nylon scraper. I used a new Exact-o knife blade to cut the gum and paint so there was a sharp edge to work to for removal. This photo shows the copper and mirror silvering removed. This was the easiest part. You can order some "Mirror Remover" from "angelgilding.com" and it is only about $7.00 for a 4.25 oz bottle of the product. The shipping costs about twice that much but is well worth the money. You apply a couple of drops on the copper, smear it around with a Q-tip, and the copper and silver disappear within a few seconds. The paint prevents the chemical from removing the copper and silver on the adjoining surface so you end up with a good clean window for the gauge. I scrapped away another 1/4" of the gum (not shown) to expose the painted surface in order to mount some double sided foam tape used to mount the screen. Time to install the DM-200. 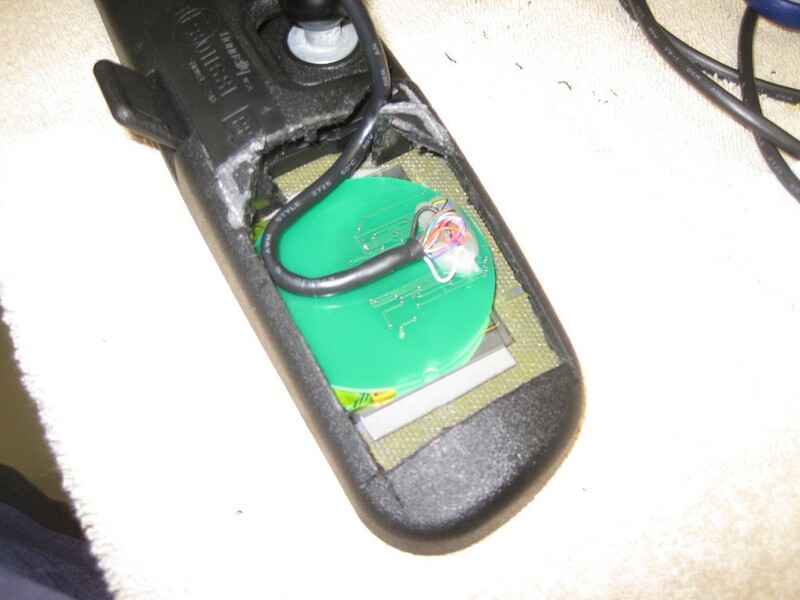 Remove the screen and circuit board from the DM-200 case. You will have to cut the bottom part of the circuit board in order for the unit to fit in the mirror. As you can see in the photo, that part of the board does not have any circuits and is only there to support the gauge in the round case that it comes in. Use a pair of cutting pliers or dykes to make the cut. Now determine the wire exit location and coordinate with the Mazdaspeed cover. Both the mirror and cover will need some careful drilling and cutting. 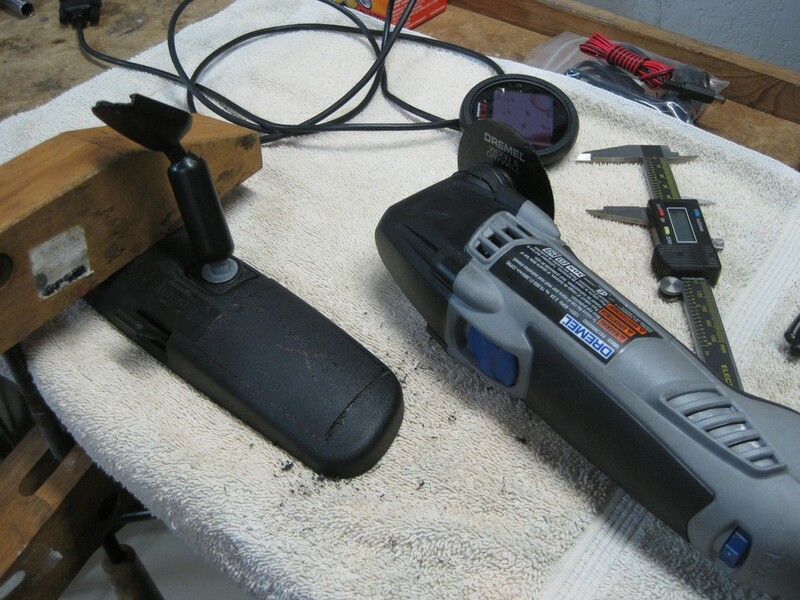 I found it best to temporarily install the cover and drill the exit hole through both the cover and mirror backing. That way you know the cable exit will line up. This photo shows the back glued in place. I used a thick gap filling CA (Cyanoacrylate/super glue) for this. In order to get it to set up quickly just sprinkle some baking soda on it and it instantly sets and makes a good bond with the plastic. I used a sharpie to cover some of the white that was left from the baking soda, but it all gets covered up anyway so there is no need for the sharpie. 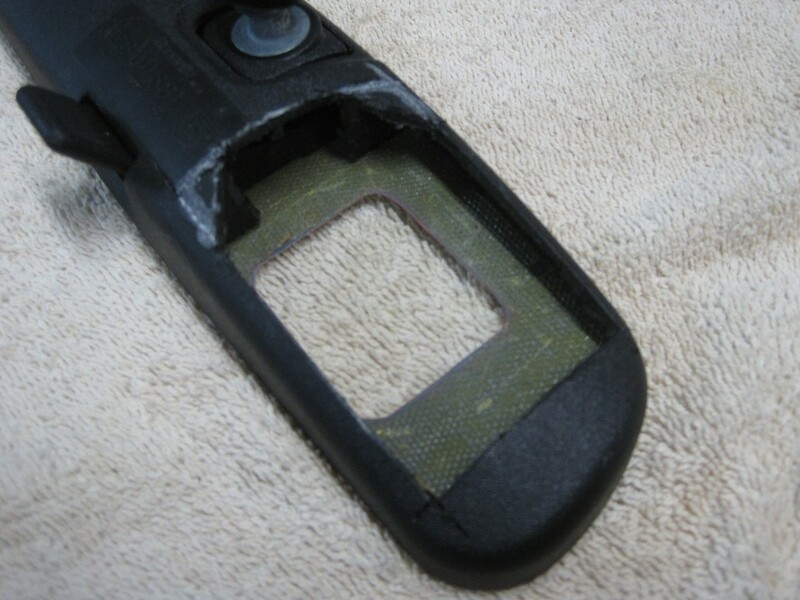 Reinstall the Mazdaspeed cover using the thin, probably 1/32", foam tape usually available at Lowe's or Home Depot. Now you are ready to get it back in the car. 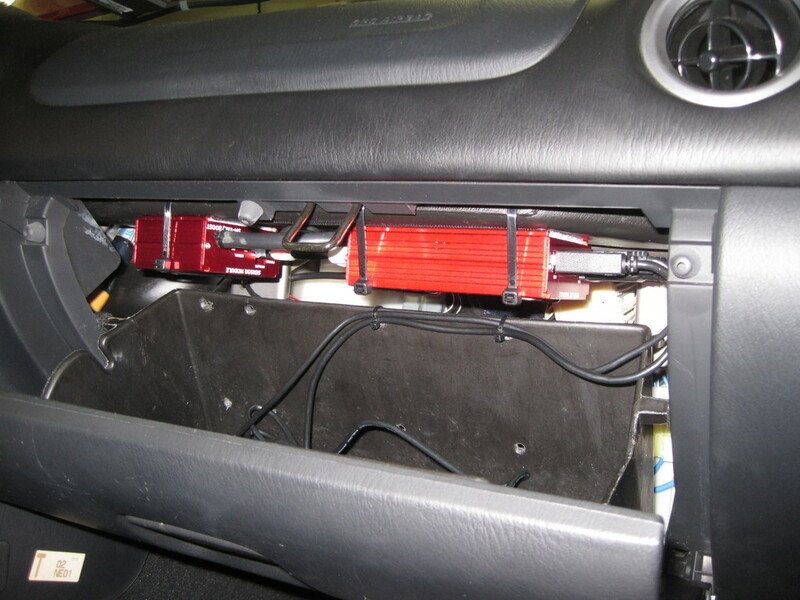 I decided to place the gauge modules just above the glove box so they could be accessed but not take up the whole box. They need to be in that vicinity since the serial cable that drives the display is not long enough to go much further. The plastic trim above the windshield and A-pillar have to be removed so just follow the Mazda recommendations on that. The DM-200 screen is not very happy with sun hitting it so i will probably fabricate a small brow that can be installed when the top is down. Otherwise it works great and is probably the least intrusive location for a needed gauge. The DM-200 can have as many as 32 other sensor modules daisy chained to it so the capabilities of this product are vast. Very cool! 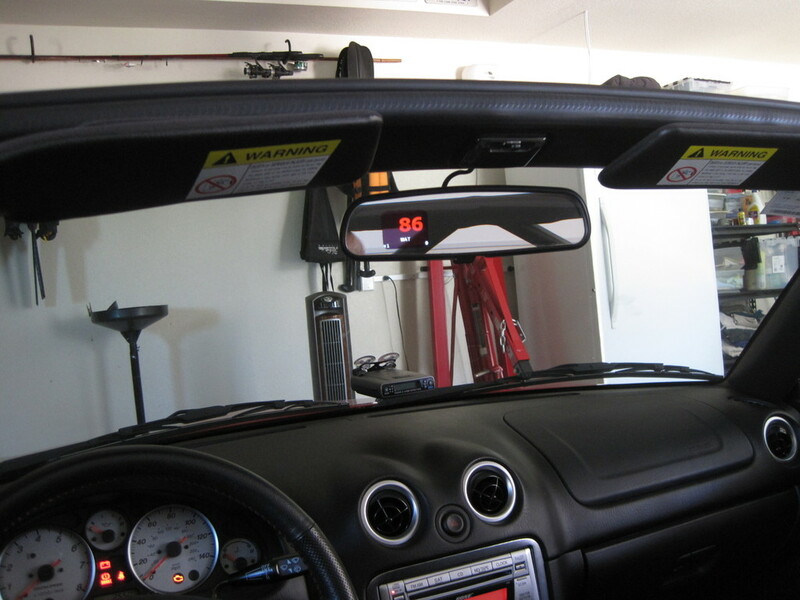 I have the PLX multi-gauge, but have never seen it mounted in the rear view mirror. +1 on very cool I'm putting this mod on my "to do list." Still working well. Thinking of adding oil temp sensor to the daisy chain. Pretty darn slick! I thought the DM-200 was a touch screen? If so, how do you plan to cycle thru the parameters if you add more Modules? Do they make a remote? I was just poking around in my car today looking for a place to mount my PLX wideband module. I looked into the same location you chose but didn't think glove box would close without modification. Did you have to cut the back down to get it to clear?. Again...pretty trick! I've seen Joe's set-up. Trying to keep the glove box. Exploring the area in the Pass. side footwell below the HVAC. We'll see how that goes first. I suspended my modules on the AC duct above the glove box and the control stays in the box unless being used. How/where did you route the O2 cable from the bung into the cabin? I don't have a wide band so have not done that yet. DM 200 has a wired remote and it is not touch screen. No mods required to the glove box. Got it, the remote is some sort of dongle it appears. I drilled a 1" hole just next to/aft of where the AC drain goes thru the trans tunnel and have a rubber blanking plug modified to pass the WB cable thru, still haven't installed it yet though.